"This morning was a far cry from revolt." Recent German cinema has a reputation for thought-provoking, entertaining films that make charged, poignant statements about society. 2004's Good Bye, Lenin! was one of the best films of that year, telling the touching story of a woman who went into a coma when the Berlin Wall was still standing, and regains consciousness after the wall has come down. 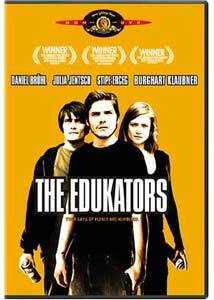 The highest profile German film so far in 2005 is The Edukators, a wily project that seems pretty straight forward at first, and then sneaks up on you with a powerful, heartfelt ending. Jan (Daniel Bruhn, star of the aforementioned Good Bye, Lenin!) lives in an apartment with Peter (Stipe Erceg), his best friend and partner in a "side-project" they call The Edukators. This small team breaks into the homes of the rich during the night but never steals anything. Instead, they rearrange all of the unnecessary material possessions of these families, shoving pictures in the refrigerator, throwing couches into their indoor pools, and stacking their furniture to the ceiling. Peter's girlfriend, a waitress named Jule (Julia Jentsch), is left with Jan while Peter is out of town. She tells him about a debt she has to one of these rich men, named Hardenberg (Burghart Klaussner), whose car she inadvertently totaled after rear-ending it. When Jan tells her about his part in The Edukators, Jule sees this as an opportunity to make Hardenberg pay for the financial hardship he's caused her. While in his house, Jan and Jule realize that they are falling in love with each other, and are on the verge of consummating this love when they are interrupted and forced to flee. Jule has left her cell phone at the house, though, and when she and Jan return to retrieve it, Hardenberg catches them. In a panic, Jan knocks him out, calls Peter, and The Edukators have their first prisoner. They take Hardenberg to an isolated cabin and engage in intense discussions about the state of German society. The Edukators isn't only divided down the middle by societal views. The two-hour running time is basically split down the middle as well, as there are two distinct sections of the story, one for each hour. The first hour mostly involves Jan and Jule growing close and their invasion of Hardenberg's home. The second half finds these revolutionaries watching Hardenberg and trying to figure out what to do with him, as they now feel like there is no turning back from what they have done. During one impressive scene, Jan is talking to Hardenberg while he is washing his clothes for the first time in decades. Herdenberg, (who was apparently much like his captors in his youth) goes on to say that his father spoke of how it makes sense to be a liberal before 30, and anyone who is still liberal after 30 is a fool. He goes on to justify his conservative status as a means to make his kids' lives better, and how such a status is just a part of society and can never be changed. The performances by these young German actors are topnotch, especially from Bruhn. Jentsch also does well in a role that requires the audience to decide how they'll feel about her rather early on, since it doesn't take her long to stray from Peter's arms and into Jan's. Erceg has an almost hapless role as the friend who is scorned by both his best friend and lover, but he has some solid moments late in the film. Klaussner, a Victor Garber look-alike, is also serviceable as a rich man whose thoughts on the grand scheme of German society are unwittingly brought to the surface by his kidnappers. The Edukators trips the clichéd trap that befalls kidnapping films, unfortunately, in that the kidnapping of someone who is at first thought to be one who deserves misfortune eventually turns out to be someone for whom his captors&$8212and the audience—care about and don't want to see harmed. Where the film avoids slipping into mediocrity, though, is its ability to avoid sappy, emotional material involving Hardenberg. We are only meant to care about him through his actions, and there aren't any forced family stories that would instantly be flagged as gratuitous. Plus, you absolutely can't go wrong with a film that features Jeff Buckley's version of Leonard Cohen's Hallelujah in its final act. Image Transfer Review: This is a 1.85:1 anamorphic widescreen transfer that is almost entirely without flaws. There is a bit of grain, but we usually can see nothing but nice image detail and exquisite sharpness. The color scheme is well rendered, and fleshtones are very accurate. Blacks and shadow levels are well handled as well, while contrast never falters either. Audio Transfer Review: The Dolby Digital 5.1 track is also excellent, making liberal use of the surround speakers, and featuring an expansive dynamic range. There isn't much call for any bass, but there are a few instances where a tight rumble can be heard. The crisp and clear dialogue works in perfect tandem with the film's score as well. 7 Other Trailer(s) featuring The Baxter, Me and You and Everyone We Know, The Memory of a Killer, November, 2046, Heights, Make It Funky! Extras Review: Unfortunately, the only extra feature is a collection of previews for other MGM Home Video releases. The Edukators is a German import that offers a little bit of something for everybody. There's musings on society, a kidnapping, and a man stealing his best friend's girl, to mention only a few of its charms. MGM's DVD is a low-key offering, featuring excellent audio and video, but nothing in the way of extra features.